Around Syracuse, one only has to ask if you are going to The Nationals to know they are referring to the annual Syracuse Nationals Hot Rod Show. 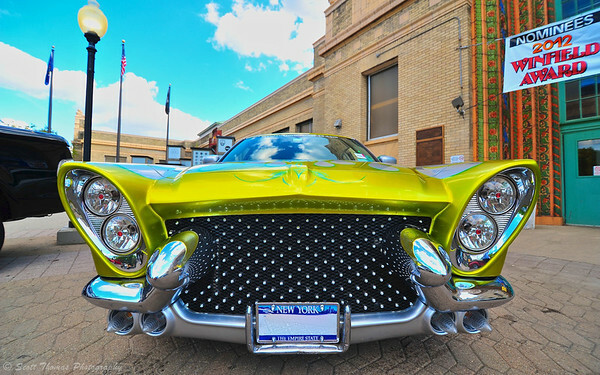 The week leading up to the huge show has central New York invaded by hot rods, muscle cars, classic cars, custom cars as well as the same kinds of trucks. With thousands of car owners and tens of thousands of visitors coming to view the cars, it is a huge boost to the local economy. Over the years, I have featured photos from the Nationals several times. The challenge is to present them here in a fresh and interesting way each time. Sure keeps me thinking as I walk amongst a gear heads version of heaven. 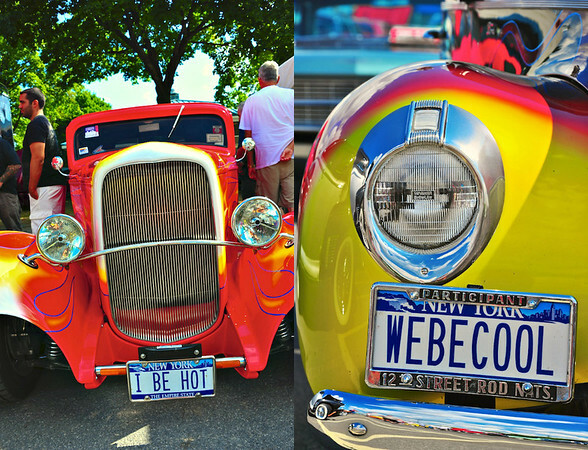 Contrasting Hot Rod Vanity License Plates. Vanity license plates is one way for a Hot Rodder to add personality to his or her ride. They give the exclamation point to an already head turning vehicle. When I saw the next vanity plate, I just knew I had to share it with you. 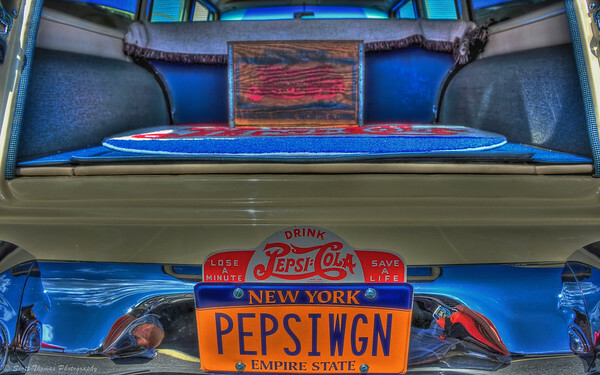 The Pepsi Wagon vanity license plate at the Syracuse Nationals Hot Rod Show in Syracuse, New York. Nikon D700/28-300VR, f/13, ISO 200, EV 0, 28mm focal length, HDR Image. Another way to keep the creative juices going is to change up what you usually do. I changed to the Tokina 11-16mm Wide Angle lens to see the cars in a different way. First, you have to get much closer to the subjects with a wide lens. Second, you have to be aware of keeping the lens perpendicular with your subject to control the distortions these lenses can create. A highly customized 2006 Dodge Magnum in front of the Horticulture building at the 13th annual Syracuse Nationals Car Show at the New York State Fairgrounds. Nikon D700/Tokina 11-16mm, 1/200s, f/8, ISO 200, EV 0, 16mm focal length. For the first time I stayed for the show at the New York State Fairgrounds’ Grandstand the Nationals include with the price of admission. The evening card featured flame throwing cars. Now, I ask you, is that something a guy would pass up? 😀 I could feel the heat from over 200 feet (60 meters) away. Flame throwing cars shooting flames fifty feet into the air at the Syracuse Nationals Hot Rod Show in front of the New York State Fairgrounds Grandstand. Nikon D700/28-300VR, 1/250s, f/8, ISO 200, EV +0.3, 150mm focal length. After sunset the lights were turned on and we were treated to the features of lawn mower racing. Yes, you read that right. Somewhere, Tim Allen from Home Improvement must be smiling. 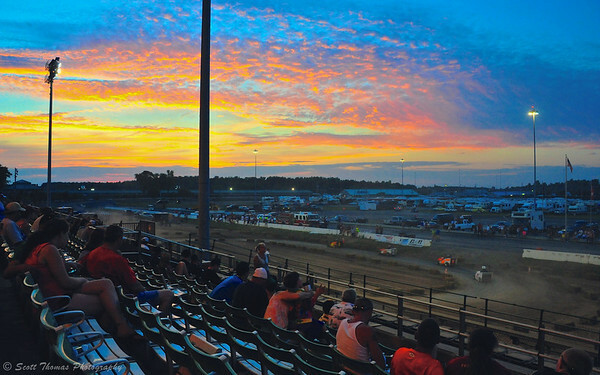 Supermodified lawn mowers race on the dirt track in front of the Grandstands at the 13th annual Syracuse Nationals Car Show at the New York State Fairgrounds after sunset. Nikon D700/28-300VR, 1/60s, f/16, ISO 3200, EV -0.6, 28mm focal length. Hope you enjoyed this year’s article on the Syracuse Nationals show. The cars and the people who own them brighten up the whole area each year. On a personal note, it sure was nice to be shooting with the Nikon D700 again. The difference in colors, sharpness, ISO capabilities and dynamic range jumps off my screen after working with the older Nikon D70 images the last few weeks. This entry was posted in Weekly View and tagged 28-300mm, automobiles, cars, central, custom, dirt, dodge, fairgrounds, flame throwing, hdr, hot rods, lawn mowers, license, magnum, nationals, new york, nikon D700, pepsi, photomatix pro, plates, summer, sunset, syracuse, track, vanity, vr, wagon. Bookmark the permalink. LOL, I can hear Tim Allen going “oh ho oh” as I look at your pictures. I am sure Mr. Allen would be grunting and oh-ing all over the place. I could not believe they had racing lawn mowers out there. They were a lot more fun than the monster trucks, too. Very cool stuff Scott. Love the wide angle shot with that 11-16mm. Nice. I call it the In Your Grille look. 🙂 I can use the lens at 16mm on the D700 until I can afford the 16-35VR. You did choose some interesting shots, Scott. Great job! Vibrant color… I am wondering if you would have enjoyed coming to a Model A convention that they had here last month? Or do you like race cars better? I took a bunch of photos but couldn’t get into blogging about them. Barry wrote more than one article with lots of pics about them. I like all 4 wheeled vehicles, Kathy. I am sure I would have enjoyed all those Fords. They really put on a show, don’t they! The whole place is awash in chrome, colors and motors. It was hard NOT to take photos of everything. 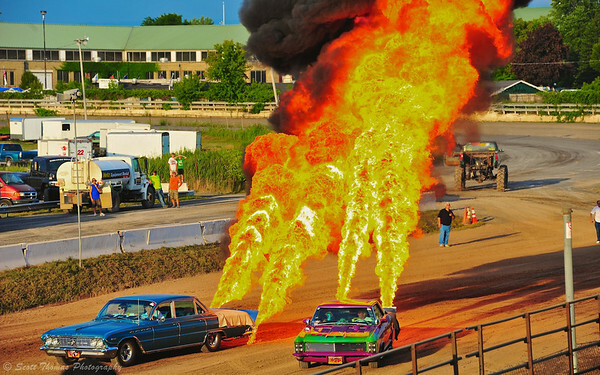 I’ve never seen the flame throwing cars before, that looks so cool. Ha! What an event! The testosterone levels are palpable, Scott! Those flames are insane!! I wouldn’t want to be where that guy in blue was standing…might lose a few eyebrow and arm hairs. Glad your baby is back and good as new. I *hate* having to send a Nikon in for repair. You never know exactly when you’ll get it back! LOL Yeah, there was lots of that of in the air! I was first told I would not get her back until after August 1st so I was very relieved when I got a call last week that it was back from repair. Good as new, too! Great shots Scott….would loved to have photographed this !! I have a lot more photos from this show to process. Colors, details, chrome, bright, dark, old, new, custom, muscle and so much more. It is a photographic delight with over 7,000 cars in the show plus vendors and the evening events.